Beaumont Glass was organized by Percy Beaumont in 1890 in Martins Ferry, Ohio. In 1902 the company had outgrown its location and was moved to Grafton, West Virginia. Soon after the relocation Percy was offered the job of manager at the Union Stopper Company. He sold his interests in Grafton factory and took on the Union Stopper Company job. The Union Stopper Company produced non-refillable glass stoppers for whiskey bottles. 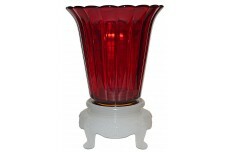 There was little need for this product so with Percy's takeover in 1906 the company began making glass tableware. Other needed items were added to the line and a second factory was purchased in Sabraton, West Virginia. In 1917 the Union Stopper Company was renamed the The Beaumont Company. 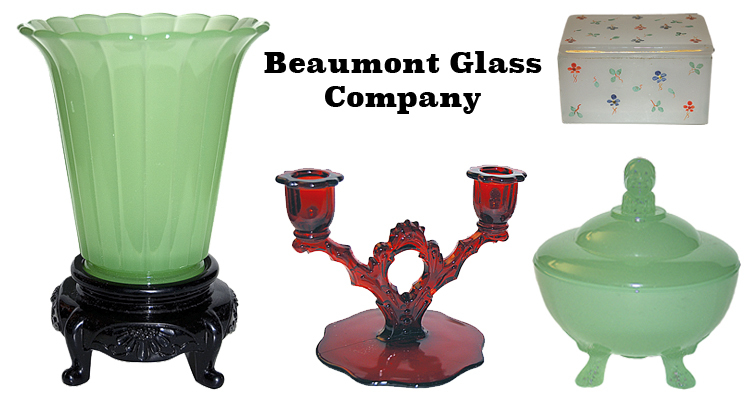 The Beaumont company was known for its light shades, ink wells, and light globes. They produced fine quality Depression Era Glassware in a translucent color known as Moonstone called Fer-Lux. Fer-Lux was created preceding World War I, This color today is know is know by many as clambroth. 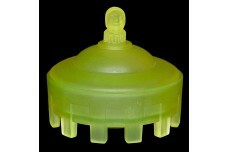 A similar translucent glass in jade was also produced. These colors were made primarily to use in the production of lamp shades and globes but were widely used later in the creation of fine glassware made for the table and bar area. Many of the Fer-Lux dinnerware and accessory pieces were hand-painted with a floral chintz design, dots, or with fancy gold decorations. Other decorations are frequently found as well. 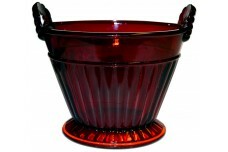 They produced an assortment of vases , powder jars and bed and bath items as well. Other well known Beaumont colors include,amber, amethyst, black, blue, blue satin, crystal, crystal satin, cobalt, emerald green, green, green satin, pink, ruby, topaz and topaz satin. Percy Beaumont continued to run the company as Vice-President and general manager. In 1947 Percy died. After that the company remained in the hands of his Grandson, Arthur B. Beaumont. Arthur served as president of the company from 1953 until1962. Late production consisted of mainly hand-made lighting products. In 1988 Beaumont was purchased by Michael Carlow who also owned the L.E. Smith Glass Company. This association was short lived as the Beaumont Glass closed its doors in 1991. Many of their molds were sold. 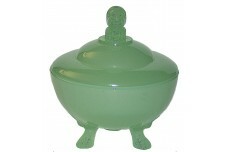 The Fenton Art Glass company bought a great many of the molds and aquired some of Beaumout's workers as well. Some information for this history of the Beaumont Glass Company was obtained from: The Glass Candlestick Book Volume 1 by Tom Felt and Elaine & Rich Stoer; Great American Glass of the Roaring 20s & Depression Era Book 1 and 2 by James Measell and Berry Wiggins; West Virgina Glass Between The World Wars by Dean Six.